Lok Satta News: ఢిల్లీలో ఆమ్ ఆద్మీ పార్టీని గెలిపించినట్టు మన రాష్ట్రంలో లోక్ సత్తా పార్టీని గెలిపించుకోలేమా? ఢిల్లీలో ఆమ్ ఆద్మీ పార్టీని గెలిపించినట్టు మన రాష్ట్రంలో లోక్ సత్తా పార్టీని గెలిపించుకోలేమా? హం ఆద్మీ అంటే ఒక ఆత్మ విశ్వాసానికి గుర్తు,నేను మగాన్ని అని చాటే మాట.కాని కేజ్రివాల్ ఏం చేశారు.బిజేపిని ఎలాగైన అడ్డుకోవాలని కాంగ్రెస్ చేయి జాస్తే ఆ చేతిని అందుకొని ముఖ్యమంత్రి అయ్యాడు. అలాంటి నీతి లేని పార్టీని గెలిపించినట్లు మిమ్మల్ని గెలిపించమని అడుక్కోవడానికి మీకు సిగ్గు లేదా? I would like to respond to the two commenters Mr. Jai Gottimukkala(26-Dec 4:10pm), Anonymous(26-Dec, 8:14pm). First of all, I am proud of the fact that Dr. JP is from our state. From his writings, speeches and actions, I can say that he has a practical vision for the development of the country(not just AP), technical skills to analyze and suggest solutions for complex issues that our country faces, 24x7 determination to act on his policies and plans without exceptions, and compassion towards every human being. If Loksatta does not get a decent vote share, it only means that it did not reach the voters. Because, if a voter understands the party's policies and its track record, I do not have a doubt that he/she will vote for the party(generally speaking). This article gives some thoughts on why the party was not able to reach the AP voters as soon as AAP reached the Delhi voters. It gives credit to Dr. JP, Loksatta and Arvind Kejriwal where it is due. I do not see anything wrong with that. After all, a party needs to show its accomplishments to ask for a mandate. But the comment by Mr. Jai Gottimukkala(26-Dec 4:10pm) seems to suggest that Loksatta is an inherently very inferior political party compared to AAP. It would have been good if the comment explained how exactly it is inferior. There is no point in simply practicing "sontha vakyalu", not backed by any content. Regarding the comment made by Anonymous(26-Dec, 8:14pm), even though it was made with a good intention, I do not agree with it on three counts. First, an insignificant one, Aam Aadmi means "common man", not the one that was written in the comment. Second, I think AAP did the right thing by taking support from Congress to form the govt. in Delhi. By forming the govt. it has a great chance to implement its policies. Coalition of political parties is not wrong. Otherwise, it would not have been allowed in the first place :). Congress is not evil. It also got 8 seats. That obviously means there is some people's mandate behind it, which should be respected. It would have been good if the comment gave any thoughts on what would have happened if re-elections were conducted and still there was a similar situation in seat-share. 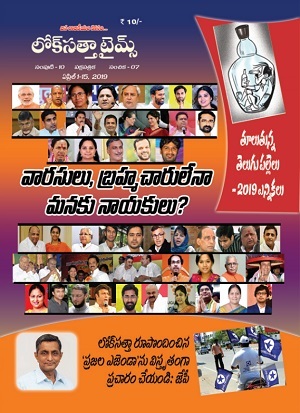 Third, as Loksatta has some policies very similar to those of AAP (like corruption free governance), it is logical for it to request the AP voters to emulate Delhi voters to elect it in the coming elections. Dr. JP has done much more for the country than any of us can in our lifetimes. So please stop slinging mud at him callously without any basis. Lastly, a piece of advice: If there is any party in our state which thinks better for the overall improvement of the society than Loksatta, then you should go vote for that party. But, I am pretty sure, you very well know that such a party does not exist in AP. You can see the usual dynasty politics, caste politics, nepotism, rowdyism and short-sightedness in almost all other political parties. If these parties win, their leaders and cadre get the benefits. If Loksatta wins, we, the people, get the benefits. If it loses, well I think its our loss. The choice is yours! "It would have been good if the comment explained how exactly it is inferior. There is no point in simply practicing "sontha vakyalu", not backed by any content"
So are your many claims. You, sir, may like to practice what you preach. >> If Loksatta wins, we, the people, get the benefits. If it loses, well I think its our loss. The choice is yours! That is what exactly other parities too tell people. Other party fans praise their parties, you are doing the same. JP టెక్నికల్ స్కిల్స్ గురించి ఒక ఉదాహరణ చెప్పుకుందాం http://sujaiblog.blogspot.com/2010/02/telangana-50-lies-damned-lies-and.html , అది చదివినాకే మీకే అర్థం అవుతుంది సదువుకున్న తెలివి లేనోడని, లేదా తెలిసి కూడా అబద్దం చెపుతున్నాడని. ఒకప్పుడు తెలంగాణా ఇస్తే ఆకాశం వచ్చి మీద పడదు అన్నాడు, ఇప్పడు ఆకాశం మీద పడినట్లే ఎందుకు ప్రవర్తిస్తున్నాడు ? ప్రతి విషయం పై తన అభిప్రాయం వేబ్సిట్ లోనే పత్రికలతోనే చెప్పుకునే JP, తెలంగాణ విషయంలో తన పరిస్కారాన్న్ని ఒక్క సారైనా సరిగ్గా వివరించాడా? సమన్యాయం, అసెంబ్లీలో చర్చిందాం అంటూ దాట వెయ్యటమే తప్పు, రొమ్ము విరుచుకొని ఇదిగో ఇది నేను సూచించే పరిష్కారం అని ఒక్క సారైనా చెప్పాడా ? >>I am pretty sure, you very well know that such a party does not exist in AP. ఎదవలు నాయకులైతే ప్రమాదం, కాని చదువుకున్న తెలివైన ఎదవలు నాయకులైతే సర్వ నాశనం. పైన లింకులో పేర్కొన్న విషయాలు తప్పని నిరూపిస్తే నేను నా వాఖ్యలు వెనక్కి తీసుకోగలను. మీరు తప్పక ప్రయత్నిస్తారని ఆశిస్తున్నాను. ఒక వేల మీరు ప్రయత్నించక పొతే, లోక్ సత్తా అన్ని పార్టీల లాంటిదే, ఆమ్ అద్మి పార్టీతో పోలికే లేదు అని నేను నిరుపించటంలో సఫలమైనట్లే. ఆమ్ ఆద్మీ పార్టీతో పోల్చుకోవటం మానేస్తే లోక్ సత్తాకు మంచిది. జనాలకు ఏదో చేద్దామని 'తెలుగు తేజం' యాత్ర మొదలు పెట్టిన ఆయన అక్కడ ఒక గుంపు ఆయనను అడ్డగించిందని కోపంతో ఆ యాత్రకు ముగింపు పలికారు, అంటే ఏదో చిన్న ఒడిదోలుకు రుచి చూడగానే ఆ జనాలకు 'ఏదో చేద్దామనే/చెప్పుదామనే' సంకల్పం నుండి విరమించుకున్నారు. అది JP గారి కమిట్మెంట్ కు చక్కని ఉదాహరణ. Jai gariki: You are right in saying that I made some unsubstantiated claims. It is indeed hard to practice what we preach :). 1. My education in economics is only until 10th class. So you might see some naivety in some of my arguments related to economics. 2. I am not as well-versed as you in the issues of Telangana people, so there could be some important details that I might be missing below. 3. I am not as committed as you towards the welfare of the society, so I cannot spend more time on this topic. So this will most likely be my last answer on this thread. and future plans of the parties to judge for ourselves. A bit off the topic - if Telangana forms, I hope KCR's family does not capture the power for long. In the spirit of self-rule, if the Telangana people are against govts. they should also be against govts dominated by one family. The blog you pointed out rightly says that comparing GDP growth rates between two regions is not necessarily a good way of comparing the well-being of the people. 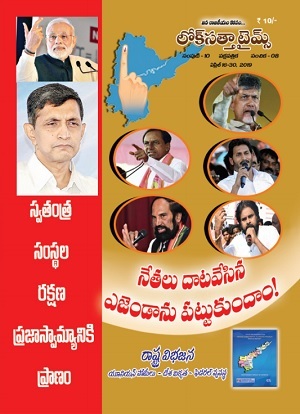 But Dr. JP was not quoting the statistics to say that the people in Telangana are better off than those in Seemandhra. He was trying to address the question of whether there has been intentional negligence by the govts. of AP, regarding the development of Telangana. I believe growth rates(not the current levels) give an indication of negligence. Further, I would expect slightly higher growth rates in initially poorer areas, so that there is equality eventually. As you know, the initial economic conditions were slightly better in Seemandhra( Rs. 181 vs 288 from http://indiansaga.com/history/postindependence/telengana.html). To develop the economy, the only thing that the govts. could work with was the growth rate, as the initial conditions were fixed. But now that the regions have been together for so long, we expect the regions to be roughly on par. As the records of AP govt. point out(http://www.ap.gov.in/Other%20Docs/STATE%20ECONOMY.pdf) Telangana and Seemandhra are roughly on par. There is still some catching up required by Telangana, but the trends are good. If there were negligence, the per-capita income gap might not be bridged. In summary,Dr. JP did quote the right statistics to address the question asked. Also, as you might know, per-capita income by itself is not a good indicator of well-being of the society. But let us not go into that as it is related to intra-regional inequalities etc. not inter-regional ones(This is an over simplication, I am aware). Further, the usage of aggregate statistics to measure the well-being is questioned by some people. We can use some better statistics (like medians, accounting for the inequality), but that does not help any better in answering the question of whether there was purposeful negligence on Telangana by the govts. of AP. It is dangerous to entirely remove statistics out of the picture while answering this question, because the answers can become very subjective. >>ఎదవలు నాయకులైతే ప్రమాదం, కాని చదువుకున్న తెలివైన ఎదవలు నాయకులైతే సర్వ నాశనం. Aayna vedhava ani meeru antunnaru. Oka goppa policy maker ani nenu antunnanu. I too was disappointed with the abrupt end of that tour. However, it is unfair to make a decision on the basis of just that one incident. Imagine the difficulty of saying something to the Seemandhra people that they are not going to agree with. He does not have the stature of a Gandhi to say something against the will of the audience and get away. (It is interesting to think how the same people who hurt Dr. JP in those meetings would react to Gandhi instead of Dr. JP. the two regions in that heated, hatred-filled environment. In a way, he understood that it is beyond his capabilities to talk to people who are deaf with emotion. But still, he was one of the few leaders who even tried to initiate a dialogue for reconciliation between the two regions. Now coming to the comparison with AAP, I said that there are some important similarities between the policies of AAP and Loksatta. Regarding commitment, from the news, I can say that AAP is also a super-committed to its ideals. But, is there any instance where AAP talked about something which the audience was prepared to dislike? Because, that was the sort audience Loksatta got in Telugu Tejam tour. He has not changed his opinion from the beginning that Telangana state formation is not going to help or hurt anybody in the state too much. Keeping in view that a majority of Telangana region has a different opinion, he started saying that Telangana can be formed, provided there is an amicable agreement between the two regions. And he says that that amicable agreement should be formed in the AP assembly. Even in the recent assembly meeting, he was appealing to the other MLAs to discuss the issue rationally. Perhaps you expect him to give a magic solution that is much simpler and yet acceptable to both the regions. This is, after all the other parties fomented the hatred between the two regions to irreconcilable levels and took irreconcilable stands. It is clear that any one person/group who makes the break-up deal is going to bear the brunt of hatred from both the regions in the coming years. He is asking the assembly to collectively design the break-up deal, so that there is nobody held responsible later, which makes perfect sense to me. Further, he suggested a good solution of decentralization of power, which is practically possible, to resolve the issue permanently. But there are no takers for that, as it is too far-fetched and too abstract. People want a straight and blunt Yes or No. Sometimes, the long-term solution is not as simple as that. "A bit off the topic - if Telangana forms, I hope KCR's family does not capture the power for long"
"Perhaps you expect him to give a magic solution that is much simpler and yet acceptable to both the regions"
Universal acceptability is at best a "nice to have". "It is clear that any one person/group who makes the break-up deal is going to bear the brunt of hatred from both the regions in the coming years"
1. The keyword here is "coming years" which is not equivalent to "long term"
Trying to "spread the blame thin" is not a mark of statesmanship. we at kphb ensured JP won .. but can u tell me what difference did he made to the area? For the tiny bit of difference he made, please visit www.kukatpallynow.com for detailed reports of the work that has been and that is still in progress. And regarding the difference you're expecting, could you kindly mention what else he should have done as MLA? Also I'm genuinely interested in knowing if any other MLA/Contestant in AP has done a better job (made a difference), please provide the details so that we can use our vote wisely. వెబ్సైటు తెలుగులో పెడితే కదా సామాన్యులకు కూడా బాగా అర్థం అయ్యేది? ఆ మాత్రం JP ఎందుకు ఆలొచించలెదొ మరి. తెలుగు మాత్రమే వచ్చిన అంతర్జాల వాడకందారులు, ఆంధ్రఫ్రదేశ్ వ్యవహారాల మీద ఆసక్తి ఉన్న అంతర్జాల వాడకందారులతొ పొలిస్తే, చాలా తక్కువ మంది ఉంటారు అనే కారణం చేత అయ్యుండొచ్చు. ఇంగ్లిష్ లొ సులభంగా మైంటైన్ చేయవచ్చు అనే కారణం కూడ ఉందేమొ. లేక డబ్బు/వాలంటీర్లు లేక పొవడం వల్లైనా అయ్యుండొచ్చు. > వెబ్సైటు తెలుగులో పెడితే కదా సామాన్యులకు కూడా బాగా అర్థం అయ్యేది? ఆ మాత్రం JP ఎందుకు ఆలొచించలెదొ మరి. so telugu lo website petta ledu kabatti, all the work that is done wouldn't count? Do you know if there is any other MLA in AP who has provided such details on a website in telugu? >>all the work that is done wouldn't count? He didn't said that. His question(and mind) when you have resources to run party blogs in telugu, why don't you provide the same details in Telugu so that will reach larger audience. Reconciling conflicting interests is the politics of Lok Satta Party and making the conflicting interests to confront is the politics of Aam Aadmi Party (AAP).This is one of the basic differences between Lok Satta and AAP. But having won the Delhi elections in a significant way, AAP slowly started telling the truths to people. AAP leader Aravind Kejriwal echoed Lok Satta Jayaprakash Narayan when he told in a latest interview that “But now I have started telling them (people) that I don't have a magic wand and it takes time to bring in change”. Let us wish all the best to Kejriwal and his team taking oath in Delhi, with the hope that AAP soon becomes comprehensive and fore sighted in the line of Lok Satta Party in the best interests of India.